I'm posting this addendum to the newsletter of 9-18-06 in order to let you know about some important presentations by members of my community it s an unnamed, diverse community that has grown from my years of work with Images of Divinity, from the 2005 Black Madonna Conference, from the Circles of Love work that s been going on since then and from my current writing. It turns about to be too much for just one newsletter. To keep this one manageable, I m only going to put in the briefest of descriptions along with links that will take you to an expanded newsletter on my website. Our friend Lisa Rafel, who just returned from singing with shamans in Mongolia, is leading a Fall Equinox event this Saturday night, September 23, in Oakland. Lisa Rafel performed and wove the music of her Tibetan bowls throughout our summer, 2005 Black Madonna Conference. it will be extraordinary, knowing Lisa and the performers and musicians she's assembled, including the remarkable improvisationalist, Rhiannon; master Didgeridoo recording artist, Stephen Kent; Oshun Priestess and storyteller, Luisah Teish; vocalist and award winning song writer, Judith-Kate Friedman, recording artist percussionist and pianist, Geoffrey Gordon; ritualist and percussionist,. Click here for details and online ticket purchase and more on Lisa . Dream Quest at Grace Cathedral, San Francisco, October 27 -28. It's been such a pleasure to be in touch. Thank you to all who've written back with congratulations on the new book and offers of help! I'm stopping here, only because of time. I could continue this list and keep going for another day, so much good work is being done. You can always give us feedback on this blog, including other news and events. Just click the comment button below the post. This what the Circles of Love blog is for! TBA), formerly titled The Keepers of Love to the publisher. The book is on its way to copyediting here in San Francisco. bringing something of value home to share. more from me about specific events when the time comes. the people of Darfur desperately need. visit http://www.savedarfur.org for more information. murdered. Today, the world must stop genocide in Darfur. " shout, speak up, make yourself heard. GIVE VOICE! This is a rare opportunity to study with Linda Tillery and Rev. my website and on this blog. "Please join us on September 24th for a Community Tashlich Observance at 3 p.m. at the Emeryville Marina. BAWIB has prepared a rich and powerful ritual to help us all move through these dispiriting times with renewed commitment to our work as peacemakers and activists. We look forward to seeing you at the Emeryville Marina. Bay Area Women in Black"
health, social justice, and spirit. I hope to see you there. the film afterward with the filmmaker. will come out in June, 2007 as well. Hence the long silences. Please post your own responses, comments, questions. This is an experiment... I'm learning to post and this is part of what I was trying to put up on our blog. Bear with me. I will add Anne Lamott's whole article once I find it again. I'm teaching my class on THE BLACK MADONNA July 31- Aug 4th, 2006 again at the Pacific School of Religion Graduate Theological Union 1798 Scenic Ave., Berkeley, CA 94709 see the course description on line at www.psr.edu Come one, come all! Walk the Labyrinth at St. Gregory's in San Francisco, read the Secret Life of Bees, and find out what the Black Madonna has to do with Mary Magdalene, New Orleans, Darfur, Iraq and racism. Did you know that there's an emerging New Civil Rights Movement in this country? July 31st- August 4th, 8:30 a.m. -12:30 p.m. brown bag lunch & discussion follows. *July 14th, 2006, Anne Lamott proposes a Bastille Day, Quiet Revolution. It sounds like a great idea, only she doesn't say where, just meet at noon on Bastille Day. I bet we can figure this out. With hopes for a turnout of 20 million, we can't all meet at her house, or mine for that matter, so let's meet at every town hall, city square, and place of public gathering. The first—and very exciting— piece of news is that I’ll be on KQED radio’s morning call-in show, Forum, this coming Monday, December 5th at 9AM. The topic of the show—“Faith and Feminism”— is one that’s been getting a lot of attention recently thanks to my friend Helen LaKelly Hunt’s new book, Faith and Feminism: A Holy Alliance. Helen’s book is an illuminating look at the alliance between spiritual conviction and social action that traces the origins of the American feminist movement to its faith-based roots. Helen and I will be joined on the show by Letty Cottin Pogrebin, founder of Ms. Magazine and of the National Women's Political Caucus and Christine Grumm, CEO of Woman's Funding Network. Please tune in and call in if you can. If your schedule doesn’t let you, you can listen to the show over the internet on KQED’s website: http://www.kqed.org/programs/program-landing.jsp?progID=RD19. This segment of Forum is part of an ongoing dialogue that Helen and I and others have been involved in with for quite a while. Last summer, following the conference on "Awakening the Energy for Change: the Black Madonna and the Womb of God" last June, I asked several friends to join me in exploring women leadership and spirituality in a continuing dialogue group. Last week, I participated in a day-long conference at the California Institute of Integral Studies that featured Helen discussing her book. Next January, I’ll be facilitating a private retreat on the women’s leadership. Many of these interweaving themes: social change, gender, reclaiming spirituality from the grip of dogmatic, institutionalized religion have been at the heart of my work for many years, all the way back to my first book, Women in the Wilderness (1980). Writing this, I find myself reflecting on the surprising journey from that book to my current one, The Keepers of Love. The connection lies in my commitment to give voice to whatever seems to be excluded from or marginalized, silenced and ignored by the dominant culture. Even as I’m writing the book, with a deadline approaching, work on Love Cemetery continues. Early next year, the chief archeologist of the Texas Historical Commission (a state agency) will visit Love with a piece of technology that will allow us to locate and map the full complement of graves in the cemetery, without disturbing the sites in any way. The great-grandson of the last chief of the Caddo Tribe will also visit. The Caddoes were the main Native American tribe in the area. Because we’ve already found one grave that belongs to a Native American woman, it’s essential that we invite Native people into the process of reclaiming Love. The whole point of The Keepers of Love—the project and the book—is to reclaim, reconcile and heal. That’s the name of the class that I’ve been taking from Linda Tillery, musicologist, singer and Bay Area Treasure and Ann Jefferson director of worship at Pacific School of Religion, music director at St. Andrew's Presbyterian Church in Marin City and Images of Divinity advisor. The class is subtitled “A Survey of African American Spirituals,” but actually, it’s a container for the deep spirit of liberation and freedom that every soul longs for. We’ve been learning these amazing songs and something about their history and development. Their use as coded instructions and information for runaway slaves (“Follow the Drinking Gourd…” “Run, Mary, Run…”) is just one way that that the genius of the African-American diaspora was able to gather the shards of the shattered African experience and forge them in the heat of suffering into an utterly unique oral tradition that ensured the survival of the culture and became a source of inspiration for all people. Attending Linda’s class has deepened my understanding of the African-American spiritual experience that surrounds me when I attend Black Baptist church services in East Texas where, inevitably, I’m the only white person. I encourage all of you to go to Linda’s website (see link above) and find out about her upcoming concerts or classes. Also, follow Ann's extraordinary choral direction, singing and composing at St. Andrew's. Watch for their upcoming concerts, like one on January 8, 2006, with the legendary singer, Odetta. Please take advantage of the “comment” feature of this blog (below) to respond to this—or any previous—posting. I was honored to sit in yet another kind of Circle of Love the other night, a small circle of IOD Advisors and members of our conference committee. I'm writing to let you know how we’re continuing to build on the powerful energy of June 18th, 2005, "Awakening the Energy for Change, the Black Madonna and the Womb of God" conference. This was our second meeting to discuss our plans for the next conference. We decided that with our conference having sold out and been attended so enthusiastically by over 250 people, we want to have a longer event. We need a budgeted conference coordinator and the time to plan. At present we’re looking at late winter or early spring of 2007. We are not planning one next summer. For summer of 2006, I’ve once again submitted my course on the Black Madonna and the Womb of God at GTU. Another focus of discussion that night in our circle centered around the experience that many of us have had "explaining" or defining what a Black or Dark Madonna is. She is the historical figure of Mary, the mother of Jesus in the Christian, Islamic, and Judaic traditions, depicted as dark or black. But what is that darkness, why is she black or dark? That's the question that's being asked. There are many reasons: she symbolizes the fertile darkness of the earth, the darkness seeds need to grow, the darkness of the womb, the darkness needed for life and for light, the darkness of shades of human skin - brown, red, yellow and black. Her darkness is good, dynamic, life-affirming. The Madonna is dark or black at different sacred sites for different reasons, there is no one answer. And there are parallel images to the dark mother/Madonna that are found in other religions. They can provide points of connection and bridges of understanding to cultures outside our own. Our discussion then turned to "fierce compassion," the subject of my last book, The Bond Between Women. “Fierce compassion” is a Buddhist concept. It refers first of all to the motivation for one's actions which need always, always to be based in love, no matter how difficult and trying the circumstances. Fierce compassion is a compassion born out of a love that is fearless. The liveliest part of our exchange centered around idea that the Dark or Black Madonna symbolizes "fierce compassion" in our own western traditions, including Christianity. Many of us in the circle that night have felt a need to take action, to work more diligently for the transformation of the suffering that surrounds us. But what action? How do we discern right action? We each are dedicated to peace in the world, but which actions can we take that are efficacious and healing? How do we discern our motives? How do we know that we are basing our actions in love as opposed to fooling ourselves and being driven unconsciously by anger or greed or hatred? We see the effect daily of people acting out of anger, pouring gasoline on the fires of conflict around the world. But how do we confront situations that are truly provocative and outrageous? How can we transform difficult emotions into loving kindness? Our task is to become genuinely motivated out of love, to cut through the knot of anger when it arises. These are not simple matters, these answers come over time. This Dark Mother/Madonna encompasses fierce compassion, she knows it intimately. We resolved for the moment to put our emphasis on sitting,reflecting, praying, sharing, and drawing upon the wisdom of the circle. We want to continue to learn how to "Choose love when there's reason to hate." "Choosing love when there's reason to hate" are the words of Sam Adkins, a man who lived through the experience of being enslaved in the South. They follow me me always. 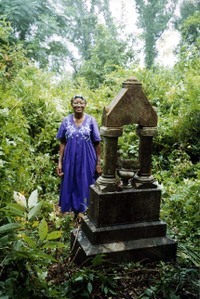 I interviewed his grandaughter for the book I'm now writing, The Keepers of Love is also an historic black cemetery in East Texas where I have deep kinship and involvement in the community. To get back to our recent evening together again as a Circle, this “blog” gives you a slice of our ongoing conversations. In posting this summary, we’re continuing to build on the extraordinary energy we all shared at the conference. The conference was aptly named “Awakening the Energy for Change…….” It has awakened something in us. We came away from the conference feeling so affirmed by the rightness of that rich gathering. We were reminded of that awakening even more the other night. We left feeling that no matter how imperfect we are, it's time to purify our hearts and come to the aid of our tattered democracy---with fierce compassion. Join us in continuing to learn to choose not only love, but to choose hope: democracy is still within our grasp. destruction of the first and second temples. considered an equivalent disaster to the fall of the ancient Temples. I watched them, stunned by their piety, certainty and messianic fervor. the cruelty of life under Israeli Occupation. the wounds of each echoing and magnifying one another. Palestinian homes that litter the landscape. on the ground. The lives on the ground. discipline needed to reach towards wholeness. all who wish to enter. a flimsy dwelling, symbolizing the fragility and impermance of life. work together in the world that does. security lies, when we share our small shaky houses. We must move from protest to resistance. We cannot erase ourselves as we organize. We must reject loyalties that create barriers to peace. Public opinion is stronger than military action. Like the roof lifted off one of the flooded homes in New Orleans revealing a dozen people up to their necks in water, our illusions about race, poverty, and equality in this country have been ripped away by Katrina. Over and over we see where our policies and practices have left many in the African American community—isolated, without means or mobility, dying right in front of our eyes. These unavoidable realities are now the stuff of daily television, radio, print, and internet discussions all over the country. The racism and environmental policies that many of us wanted to ignore or deny are front and center right now. Even the news anchors—from all sides of the political spectrum—are outraged at the slowness of the federal government to mobilize until several days after Katrina hit. The heartbreaking news from Louisiana and the Gulf Coast’s devastation brings the need for profound change in our society right into our living rooms. But how to bring that change about? We started this page on Circles as part of our vision from our June 18th, 2005 conference “Awakening the Energy For Change: The Black Madonna and the Womb of God.” It’s one thing to know that change is needed, it’s another thing to have the energy to change, first of all ourselves. This is why ongoing circles were part of my vision for growing that extraordinary energy from our sold-out conference. Circles can provide a form in which look deeply at our country, our community, and ourselves. We started this private page on our website to foster connection and dialogue amongst those who attended the conference and to give attendees a way to continue to be in contact. I’m writing today to tell you that we’re changing this format to a blog—an on-line journal for our circles as they grow. We’re shifting so that everyone who comes to this page can more easily read the earlier entries and see each other’s email addresses rather than having to click on individual messages one by one. I’ve been part of a Circle of Love ever since the conference. I chose this name for our circles in order to provide an antidote to the fear and terror that we’re constantly bombarded with theses days. We need cells of love to “combat” terrorist cells, many said just after 9/11, most famously, Marianne Williamson on Oprah and most beautifully by Lucie Blue in her song "Cells of Love." I’ve suggested that the Circles of Love focus on the theme of reconciliation and sit with the question, “With whom do I need to be reconciled?” We’ve been meeting in the East Bay since our June conference, and will be meeting again next week, mid-September, 2005. Once the group further solidifies, our intention is to split up into three groups that meet in the East Bay, North Bay (Petaluma and parts north) and Marin. Another group is trying to form in the South Bay. A second small East Bay Circle of Love met in July, with Sandy Butler and Margi Adam. 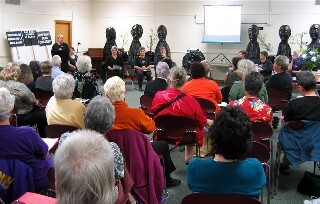 They skipped an August meeting as Sandy was is the spokeswoman for Women in Black in the Bay Area, and Bay Area Women in Black were selected to represent the United States at the International Conference of Women in Black in Jerusalem in August, 2005. We look forward to Sandy’s news from Jerusalem and to continuing growing Circles of Love in collaboration. Rev. Sandy Gess of Oakland and Weave of Faith, has continued to convene her ongoing Black Madonna Circle that grew out of our Black Madonna Study Group meetings in Berkeley and Mill Valley over the last two years. Please see the entries posted below. (all entries from June 18-August 4 are in a separate post below). Shortly after our conference, I wrote out guidelines for “Circles of Love” meetings. Please let us know if you’re meeting, when and where. Setting up this Circle Date: 14 Jun 2005 Name Corey Fischer (China's husband and your friendly webmaven) Message I've been having a wonderful time creating this virtual space for you to share your writings, thoughts, dreams.... This is my way of supporting my beloved wife's work which I feel is tremendously important for all of us, men and women, in these times. Enjoy! Starting a Circle in the North Bay Date: 19 Jun 2005 Name Marylou Message My only regret at the wonderful conference is that we did not have a chance to connect geographically. Is there anyone else in the North Bay who is interested in starting a circle? Re: Deepest Heart Felt Gratitude Date: 21 Jun 2005 Time: 11:13:05 -0400 Name Reda Rackley Message Dearest Sisters and Brothers, I wish to thank all of you that put so much time, energy, love, commitment, blood, sweat, and tears into bringing the Sacred Feminine to for so many people to experience. It has been a very long time since I have felt that stirred and so deeply inspired to do even more to dancing Mama back into the homes and hearts of all humans. Thank you thank you thank you. A Circle Date: 22 Jun 2005 Time: 01:27:07 -0400 Name Terry Message I live in the South Bay and attended the Saturday Conference. More dialogue would be a good start. Re: Starting a Circle in the North Bay Date: 22 Jun 2005 Time: 23:58:17 -0400 Name jess Message Where in the North Bay? I am interested and live in Mill Valley. Re: Starting a Circle in the North Bay Date: 23 Jun 2005 Time: 21:24:07 -0400 Name Marylou Message I live in Sebastopol. I can drive. Black Madonna Conference Date: 26 Jun 2005 Time: 17:30:31 -0400 Name Carol Newhouse Message These are questions I have been thinking about and were raised and accentualted by the conference. I would welcome any input or discussion. Is the Dark Mother the shadow side of the White Goddess? OR is she a fully embodied version of our woman's experience,the sickness or disease AND the cure? If she is the whole thing, the truly divine Mother not just an aspect of her,then why is she called the dark mother? Is perhaps the Dark Mother a racial or cultural representation? ........ the Mother being called Dark because she is from a place that had dark skinned women worshiping her there? Like Guadalupe? or Isis? Is the Dark Mother the same Mother Goddess white women worship but with dark skin? Or is she really different spiritually? Re: Starting a Circle in the North Bay Date: 06 Jul 2005 Time: 12:53:48 -0400 Name Marylou Message I heard rumors that a circle in Petaluma might be forming and that would be fairly central for all of us. Does anyone know of this? Have any ideas? Where could we meet? dark Mother Date: 14 Jul 2005 Time: 10:57:40 -0400 Name Deborah Rose Message I want to jump in and respond to Carol's wonderful questions but first to say thanks to Mary Beth Mosher for leading me to this site and congratulations to China - and all the many many people who produced a conference that was clearly quite amazing and that unfortunately I did not attend! In my own experience Carol's questions are the "medicine" of the Black Madonna - that is, we tend to see her through the filter of white consciousness where white is normative and so we think oh she must be the shadow or just representing dark skinned people. Whatever our skin color, because white has been dominant, it is hard to reconcile darkness and femaleness with divinity. That is what is so provocative about the Black Madonna icons - they shatter our (mostly unconscious) illusions about the nature of reality. Certainly that is what happened for me in encountering the Black Madonna - and yes in white culture she does hold the shadow aspects - and ironically, as China and Lucia and others have pointed out, for us today, that often means resistance to oppression, equality, justice. She holds ths whole, all that has been marginilized, But also important to say like any good icon she means many things to many people. In France during the Middle Ages she was used by the ruling class and seen by the Revolutionaries as an embodiment of the status quo. Obviously we see in her something very different. Circle in the East Bay Date: 04 Aug 2005 Time: 03:40:45 -0400 Name Sandy Gess Message Hi. For folk who are interested in a Circle in the East Bay, we started a Black Madonna Meditation Circle before the Conference - as part of the gatherings of Weave of Faith-Christian Feminist Community. We started with China's blessing, after some many of us had been part of a Circle she had organized in the East Bay. Weave of Faith has been meeting for over 12 years in Oakland as an independent woman's worshipping community which, while grounded in the judeo-christian tradition, integrates women's spirituality and provides an environment for women to explore our own theologies, seeking the feminine face of God in all of Her manifestations. Our Black Madonna Meditation Circle meets once a month - alternating between gathering in a space which we rent at a local church in Oakland, and member homes. Right now, our members come from various traditions: Methodist, Quaker, Catholic, United Church of Christ, Baptist - all are women who have made personal pilgrimmages to experience the Black Madonna, bringing much to our gatherings. The Circle has become very important in our personal and spiritual lives and is a source of tremendous support. Email me if you would like to find out more about our Circle or call our Weave of Faith message phone (510) 482-9319. Welcome!